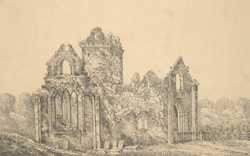 Sketch of Sweetheart Abbey in Galloway, Scotland. The Abbey was founded as a daughter house to Dundrennan Abbey and was the last of twelve Scottish monasteries to be established. It is thought that it was renamed ‘Dulce Cor’ or ‘Sweetheart’Abbey in honour of the love Lady Devorgilla had for her husband John Ballioli. They were known to have been devoted to one another and when he died she wanted a constant reminder of him and had his heart embalmed and placed in a casket. When she died 20 years later the casket was buried with her in the grounds of the Abbey. The Cistercians were known for their austere building style but as can be seen from this sketch Sweetheart Abbey had decorative carvings and ornate windows.